We live in an amazing age of technological wonder. Almost all of us carry an amazing little computer around with us each day. It lets us talk to people on the other side of the globe no matter where we are. It wakes us up. It plays us music. It captures our memories. It puts us to bed. It satisfies our inexplicable need to tell people things in 140 characters or less. Nomophobia.com is the simple little idea from a group of friends who have been discussing (alright, arguing) about the existence of nomophobia for years. When the biggest skeptic among us experienced his "Chief Brody" conversion, nomophobia.com was born. It's the product of our own sweat, time and sense of fun. As to the immediate future, our modest aim is to just grow a community for nomophobes and a nexus (a bus-station, if you will) for all things mobile. 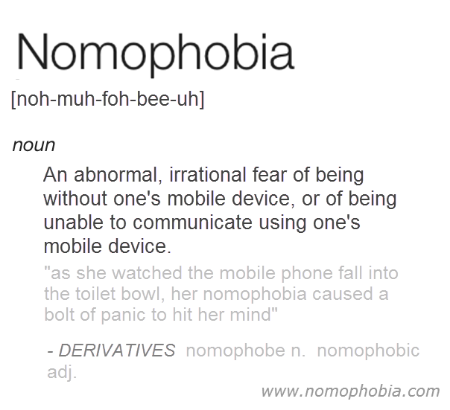 We want nomophobia.com to be a place where mobile users from all parts of the world can come to find out about this, ahem, condition. We want people to live in peace and harmony with their little technical wonder bricks. The best way to do that is to share experiences, news and information. Oh, and loads of funny pictures, movie clips and memes... lots of memes. We're certainly not banking on making a living out of this, although we'd like to cover basic costs of hosting and any big chunks of our own time. So we may consider some inline banner ads to generate some click revenue. But we're torn about it because banner ads are, well, ugly and flashy and annoying. But fair warning: we will probably experiment to see if we can get a balance we're happy with. Into the future we may see if there are other ways to support our service. If we can come up with some cool and fun merchandise ideas (bewarned: at least 2 of us like funny t-shirts! ), then we might give that a try. We'll see how it goes. Beyond that, we cannot exclude the possibility of doing sponsored articles, such as reviews of products that can help nomophobes. It's only a distant possibility but if it ever happens, then we will be very open and honest; such posts or articles will be clearly tagged as 'sponsored' (or similar). We are a group of friends and colleagues who spend most of our time making a living in other professions. What's in it for us? Well, it's something that interests us personally. It could be fun. Plus it feels good to try build and grow a community. We've a mixture of editorial staff - those who spend a good deal of their time getting things out - and a family of contributors who add their few cents when they get a chance.